Tips for a Safe & Happy Halloween with Food Allergies: Don't Be Scared, Be Prepared! This post is sponsored by Nice 'n CLEAN. Read my full disclosure statement here. This time of year the stress level of a food allergy parent skyrockets. Food centered holidays involving parties at school, church, with friends, and with family. I'm often asked how we handle them, especially Halloween. My answer: Don't be scared, be prepared! Little Miss is now eleven and we have never shied away from participating in Trick or Treating. Since a young age, we have always had a plan in place and I've taught her how to handle situations. That being said, it's important as parents we are prepared with how to deal with situations as they arise and should your child come in contact with an allergen. Always carry epinephrine auto-injectors, inhalers, antihistamines, and Nice 'n CLEAN Antibacterial Hand Wipes. The Teal Pumpkin Project is helping to raise awareness during Halloween for not only food allergic children, but those with Celiac Disease, Diabetes, or anyone on a specialty diet due to an intolerance or special needs. 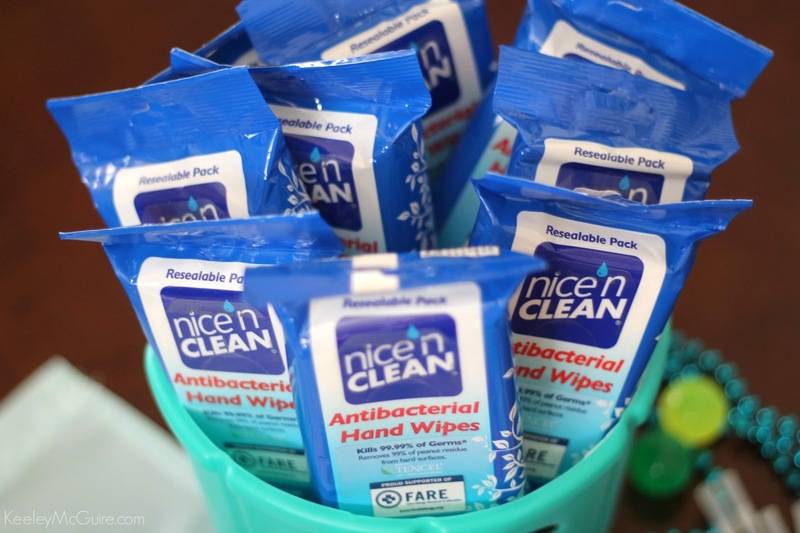 Nice 'n CLEAN has partnered with FARE (Food Allergy Research & Education) to support their mission in safety and inclusion for children with food allergies, no matter where they are. Nice 'n CLEAN wipes are proven to remove 99% of peanut residue from hard surfaces. My daughter self-carries her medication and she has the same items in her purse as I do when we leave our home: Epinephrine, antihistamines, inhalers, tissues, a safe snack, and a package of Nice 'n CLEAN Antibacterial Wipes. On a night such as Halloween, I make sure to carry my purse with all these items while she is focused on fun and visiting neighbors door-to-door. 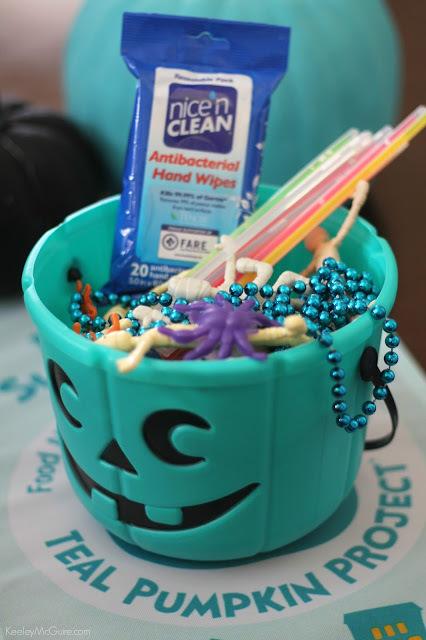 While the Teal Pumpkin Project is starting to become more popular with more people participating, it's still not a significant amount to fill your child's bucket with safe non-food treats. Have a plan. If you're uncomfortable with your child touching treats people are handing out, teach them to hold out their bag or bucket and politely ask neighbors to drop it directly in so they don't have to touch it themselves. You could also have your child wear gloves - either due to cold temperature or as part of their costumes - to keep allergens from touching the skin on their hands. It's also important to teach them to not eat any of their treats before you inspect them and read all the labels to determine what is or is not safe. Talk to your neighbors. Most are understanding and willing to help your child be safe. See if they'd like to participate in handing out non-food treats in conjunction to candy treats for food allergic kids or children on special diets. You could also provide them a non-food treat and ask they hold it aside for your child when they ring their bell. That way, you know they have safe places to visit Halloween night. Make it a game. 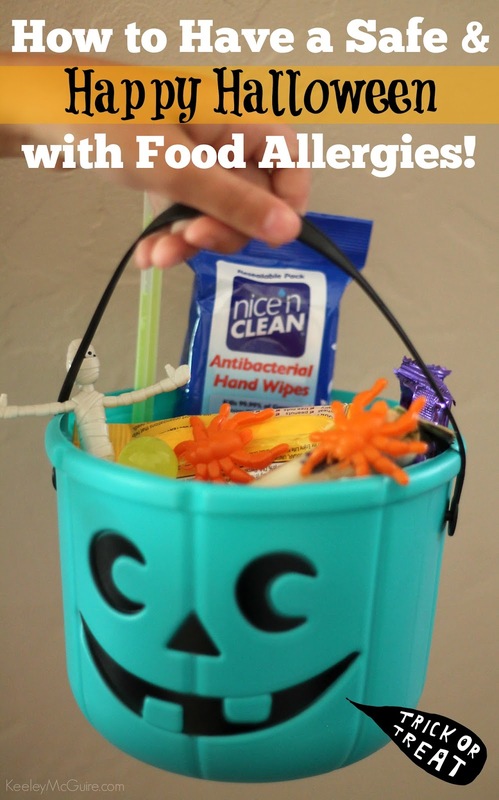 Knowing that there will be lots of candy and most of it probably not safe for their allergens, try to make it a game by collecting treats to share with others. My daughter loves to try and collect other family members favorite treats so she can share. She actually gets joy out of finding the favorite candy of her Uncle, for example, or a neighbor. Then, as we are sorting her candies at the end of the night, we create piles for each person she shares with so we can bag it up and give it to them. The fella also takes other non-safe treats into work so we get them out of the house. Trade for Treats. Have their favorite allergy safe candies at home or non-food treats so at the end of the night they can trade-in the items they can't have for safe items instead. That way they don't feel they're missing out. The non-food treats are also great so they don't get sugar overload! Be prepared. When you're out trick-or-treating, make sure your family is carrying their epinephrine auto-injectors in case of emergency (+ other medications) and Nice 'n CLEAN Antibacterial Hand Wipes. As mentioned above, I have a pack in my purse or pocket everywhere we go, but I also plan on having my daughter carry her own pack. Besides it removing peanut allergen residue from hard surfaces, the wipes also kill 99.99% of germs on hands. Think about everything they may touch - doorbells are germ central! Yuck. Thank goodness for wipes! The best part? 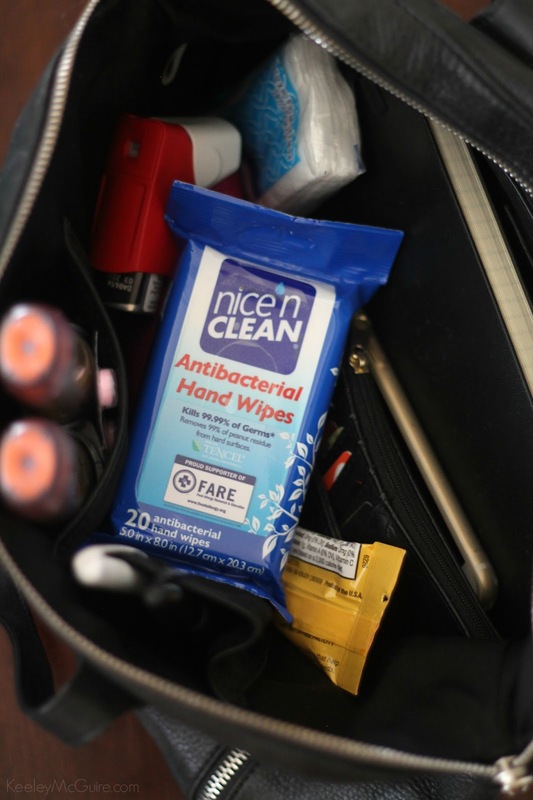 1% of all purchases of Nice 'n CLEAN Antibacterial Wipes are donated to FARE to help advance their advocacy and education in communities across the country. You can purchase Nice 'n CLEAN Wipes on Amazon or at CVS, HEB Supermarkets, Harmon, Family Dollar, other major food, drug, and discount stores. This post was sponsored by Nice 'n CLEAN. All opinions are my own.